No, that’s not a typo — I’m going to give you some advice on using the new spin option of bite with Golden Tee’s 2012 release. 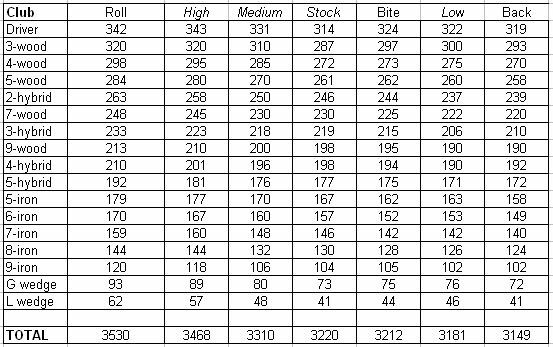 Now that everyone’s hopefully played a few rounds on the 2012 courses, you’ve learned a little how bite works. This can be incredibly useful on hard-sloping greens and/or with tough winds where backspin or no spin would otherwise not give you a chance to stick it close. Let me break it down more for you so that you can know what to expect and when to use this great new spin feature. Bite essentially causes your ball to stop and settle once it hits the ground. You’ll notice that it stop/skips twice on contact, and then it rolls out from there. But how much will it behave like backspin, and where will it roll afterwards? Using a no pull back, regular thumb shot, you will get about 10% of normal backspin. This is not much at all. So when thumbing a shot into a green with bite, keep this in mind. With a hard thumbs, no pullback shot, or a smooth push shot, you will get 15-20% of regular backspin. Using a pull back, smooth palm shot, you will get 20-25% of normal backspin. Pulling back and hitting it hard will get you about 33% of regular backspin. So, that should help you know what to expect when the ball first hits the green. You probably have a feel for what backspin is going to do already, so keep these percentages in mind when thinking of how bite is going to behave differently. Now, where is the ball going to end up after it’s done biting? First, let’s talk about the loft of your club. 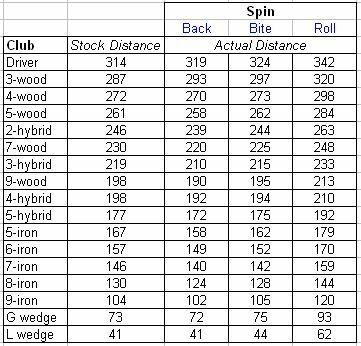 Keep in mind that bite, just as with backspin, is stronger with higher lofted clubs. The percentages at the top still hold true, but a lob wedge into a headwind with bite will certainly come backwards, whereas a 2-hybrid would actually continue forward after the bite is done. 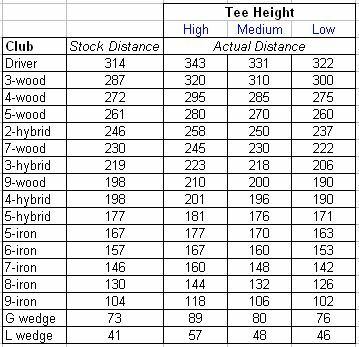 It’s due to forward momentum — a lob wedge would be coming straight down, while a 2-hybrid will still have strong forward velocity. These concepts were the same with backspin, so if you have a handle on backspin in regards to loft, you can carry this knowledge forward with bite. 1) Tailwind into a flat green — expect the ball to end up slightly forward of where it lands. The momentum of the wind is more than a couple skips of bite can overcome. 2) Headwind into a flat green — expect the ball to come back slightly backwards of where it lands. 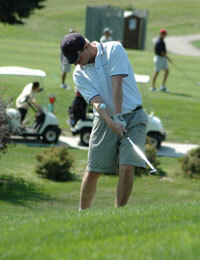 The combination of wind and bite should overcome the forward momentum of the ball. 3) Bite into an upslope — expect the ball to come back slightly backwards of where it lands. The combination of bite and slope should overcome the forward momentum of the ball. 4) Bite into a downslope — expect the ball to end up slightly forward of where it lands. The momentum of the ball and slope of the green are more than a couple skips of bite can overcome. 5) Tailwind into an upslope — expect the ball to come backward just a bit. The wind will be carrying the ball forward into the green, giving it forward momentum, but the bite and upslope will cause the ball to stop and settle backwards a bit once it hits the green. 6) Tailwind into a downslope — the ball’s distance will only be slowed a few yards. This can be a great shot into a green where the pin is in the back. Where backspin would bring the ball back up the slope, bite just causes it to settle and still roll down a bit towards the pin. 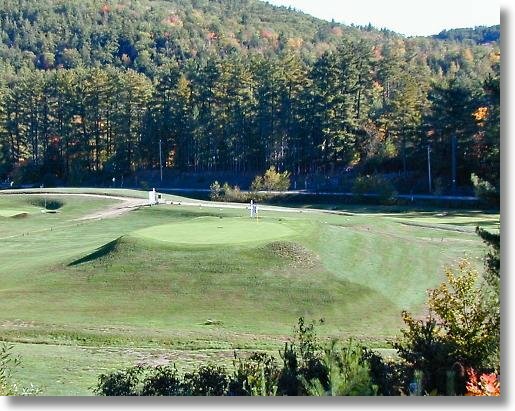 7) Headwind into an upslope — your shot will look like it has backspin on it. This can sometimes be a good option into a big green where the pin is in the front. Whereas backspin would pull the ball back off the green, bite gives you a softer roll back down towards the cup. 8 ) Headwind into a downslope — expect the ball to come backward just a bit. The wind will be slowing the ball’s forward momentum into the green, and the bite will cause temporary backspin, but then the slope of the green will cause the ball to settle forward a bit more. 9) Wind blowing left, slope going right — if you don’t cut the ball into the wind, expect the ball to end up just short of where it lands. The wind gives the ball momentum left, and bite will initially pull the ball left as well, but then those factors expire and the slope pulls the ball right again, settling just short of where you land. 10) Wind blowing left, slope going left — this can be a great use for bite if the pin is also on the left. Land the ball just slightly above the hole to the right, and the bite and slope will cause a slow movement back towards the cup. As a final note, just picture what backspin would do — if you don’t quite like it, then consider the slope and wind factors and decide if bite is a better option for you instead! Another problem that afflicts Golden Tee beginners and some amateurs is the overuse of backspin. These guys will take away any chance they have of getting close to a back pin by landing in the middle of the green with backspin, or they will spin a shot back off the front of the green by attacking a middle flag with backspin and coming up short. In most of these situations, I’ve learned to avoid backspin and roll the ball right up to the flag. You just have to get over being scared of being long, and play the shot with a little less power. With a back pin in Golden Tee, there are very few situations where you want to use backspin. Your goal should be to land the ball on the front or middle of the green and let it roll back towards the flag. Of course, with a severe downslope and/or a low-lofted club, you can get backspin to check up by the pin, but usually, you’ll want to account for the slope and let the ball do the work! With a middle pin, you can go either way, depending on the other factors (wind, slope, in-between clubs, elevation) of the shot. Still, I see backspin used almost automatically by most beginners when avoiding it would be the much better play. These situations are where developing a good “thumb shot” can do wonders for your game, since I believe it’s easier to control distance/power in Golden Tee with a thumb shot. Practice landing on the front of the green with a thumb shot and watch the ball roll up by the cup! Almost as important as learning different shot types using the trackball is learning when and how to use backspin and roll. This section contains important tips to consider towards putting spin on the ball during a round of Golden Tee. When you’re driving into the wind – this helps keep the trajectory low, so the ball will fight through the wind better. And, the roll will add even more distance once the ball hits the ground. When you’re driving level with the ground and with the wind at your back – I’ve found that if you have a ton of fairway to work with and your shot is pretty level from tee box to fairway, roll usually helps gain extra yards. When executing a A1 or C3 hook shot – these shots have natural roll on them anyway, but if you can land with the right angle on a long fairway, you can get the ball to roll a LONG way in Golden Tee, resulting in a monster drive. When hitting into the wind towards a green with a back pin – hitting a low shot with topspin gives you a better chance of rolling the ball up towards a pin in the back of the green. When hitting into the wind towards a green with a steep upward slope — hitting a low shot with topspin gives you a better chance of rolling the ball up towards a pin when there’s a big upslope. You’re fighting wind and slope, so countering with topspin is a good move. When shooting into a patch of rough or sand where there’s fairway or green behind it – adding topspin to this shot might give the ball enough speed to skip right through the undesirable lie. When you’re trying to keep the ball low – adding roll decreases trajectory, and even if you nip a tree branch, the topspin will still help the ball have some velocity. When hitting a wedge into a green (sometimes) – wind and slope can really affect a chip shot in Golden Tee, so sometimes it’s best to add roll to keep the ball lower and more on track. When hitting into a green with a front or back pin – it’s best to let the ball land in front of the hole and roll on up towards the pin. When hitting an approach shot into the wind – it’s best to take an extra club and let the wind knock the ball flat by the pin. When you’re driving up or down hill – you’ll want carry on each of these shots, so just pull back and let it rip! When hitting an approach shot into an up-sloped green – attack the front of the flag and let the slope of the green stop the ball. When you’re executing a punch-and-run chip shot – the point of this shot in Golden Tee is to try to roll the ball into the hole. You don’t want backspin or topspin adding any more complexity to the shot – have confidence and roll it in! When you’re driving up or down hill – you’ll want carry on each of these shots, so avoid topspin, which decreases the trajectory. When hitting towards an elevated landing area – roll significantly decreases trajectory in Golden Tee, and although you may have enough distance, you might not get the ball high enough in the air. When hitting with the wind – on drives, it might not end up adding any distance, and on approach shots, you might not hold the green. When hitting towards a hazard – it’s much better to use backspin to stop the ball at the desired landing area than to try to roll the ball up close to danger. When hitting an approach into a green with a downward slope – you don’t want to roll the ball off the back of the green, do you? When hitting into a green with a front pin – you’ll either be short in the rough or long towards the back of the green. When the pin is at the back of the green – this means there’s really no room behind the pin, so you’ll probably either land it in the rough behind the green (where it won’t roll back), or you’ll land it by the pin, but it will roll back all the way towards the front of the green. Try to hit a shot that lands in the middle of the green and rolls forward towards the pin. When the green slopes up from the direction of your approach – this means that if you use backspin, the ball may roll all the way back off the front of the green. Instead, try to stick the ball by the pin – the slope will keep the ball from rolling much further. When you’re hitting with the wind in your face – the wind will naturally slow the ball as it approaches the pin, so applying backspin might cause the ball to roll all the way back off the front of the green. Attack the pin and let the wind stop the ball. When trying to land your ball on the front of an island – you don’t want the ball to roll back off the front of the island into trouble! It’s better to be a little long in this case. When you’re executing a punch-and-run chip shot in Golden Tee – the point of this shot is to try to roll the ball into the hole. You don’t want backspin adding any more complexity to the shot – have confidence and roll it in! When you want to shoot under a tree – backspin tends to give the shot a bit more trajectory in Golden Tee, but you want to keep it low. 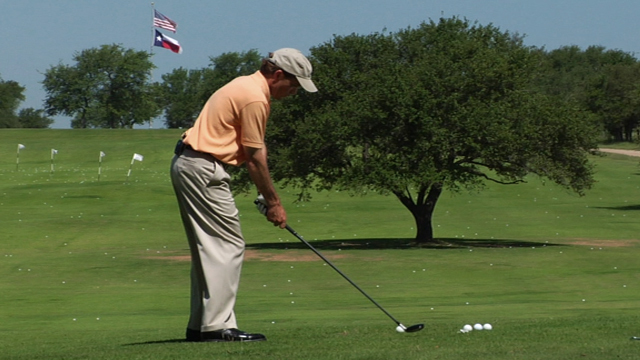 Try hitting a longer club with less power, and maybe even add some roll to keep the trajectory low. When the pin is at the front or middle of the green – this means there should be plenty of green behind the pin, so you can land the ball safely towards the middle/back of the green and roll it back towards the pin. When the green slopes down from the direction of your approach – this means that without backspin, the approach shot might roll all the way off the back of the green. You’ll be surprised how much backspin you can still get back up the hill on a fairly steep downhill slope in Golden Tee. When you’re hitting with the wind at your back – the wind will carry the ball forward with some velocity, and without backspin, the ball can roll quite a ways after it lands. Use backspin to help combat the wind in this manner. When you’re hitting a low-lofted club (especially long woods) – normally, these shots are bouncing into the green with low-loft, so backspin acts as a great tool to get your ball to stop on the green. When you’re trying to get as close as you can to a hazard without going in – backspin can help ensure your ball doesn’t keep rolling down that fairway slope towards danger, or it can ensure your ball stops before it gets too close to that water. When you’re trying to land on an island – it’s hard to land and stay on an island in Golden Tee if you don’t use backspin. Try to land the ball towards the back of the island and use backspin to keep the ball there. When you’re playing a big, long hook into a green – backspin can help to stop the ball on or by the green, since the big, hooking shots create a lot of roll on the ball! For added loft – backspin tends to give the shot a bit more trajectory in Golden Tee, so it might help you clear that tree or obstacle in your way!